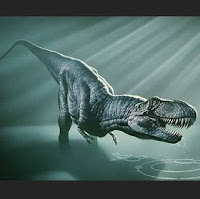 Tyrannosaurs are thought to have the most powerful sense of smell out of all dinosaurs, with some having curled tubes of bone inside the nose. These coils most likely would've been covered in a mucus that trapped smells in the nostrils, giving a stronger sense of smell to the animal. T. Rex would have had the second best sense of smell of all the animals at the time, bested only by its earlier ancestor Daspletosaurus. These skills are an aid for both a scavenger & a predator.